After a 15-year battle, local campaigners infuriated by pollution, over-pumping of groundwater and land-grabbing have finally forced the closure of Coca-Cola’s $25 million factory near Varanasi. The Coca-Cola company has been forced to abandon a $25 million newly built bottling plant in Mehdiganj, Varanasi, India as the result of a sustained campaign against the company’s plans. The $25 million plant – which was a significant expansion to its existing plant in Mehdiganj – had already been fully built and the company had also conducted trial runs, but could not operate commercially as it did not have the required permits to operate. Coca-Cola required permissions, or ‘No Objection Certificate’ (NOC), from the Central Ground Water Authority (CGWA) – the national groundwater regulatory agency, and the Uttar Pradesh Pollution Control Board (UPPCB) – the statewide pollution regulatory agency. The Central Ground Water Authority rejected Coca-Cola’s application to operate for its new facility on July 21, 2014, and had sought time till 25th August 2014, to announce its decision before the National Green Tribunal (NGT), India’s ‘green’ court. Somehow having learnt that its application had been rejected, in order to save itself major embarrassment, Coca-Cola sent a letter to the CGWA on Friday, August 22, 2014 – two days before the rejection was to be made public on Monday, August 25, 2014 – stating that it was “withdrawing” its application. Bizarrely, Coca-Cola blamed “inordinate delays” by the authority as the reason for its “withdrawal” just two days before the decision was to be made public. The campaign has worked for the last two years to ensure that the regulators were made aware of the problems being created by Coca-Cola’s existing bottling facility, and the reasons why a five-fold increase in groundwater allowance that Coca-Cola had sought for its new facility would further deteriorate the conditions in the area. The Uttar Pradesh Pollution Control Board (UPPCB) had also shut down Coca-Cola’s plant on June 6, 2014 because it found the company to be violating a number of conditions of its license, including a lack of NOC from the Central Ground Water Authority (CGWA). The groundwater conditions in the Mehdiganj area have gone from ‘safe’ category, when Coca-Cola began operations in June 1999 to ‘critical’ in 2009. As a result, severe restrictions have been placed by the government on groundwater use by the community and farmers. 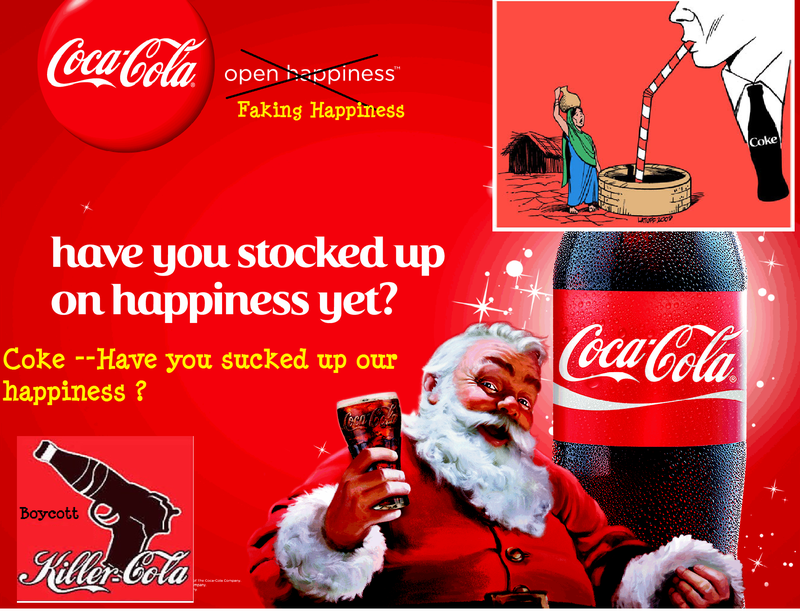 “Coca-Cola is a shameless and unethical company that has consistently placed its pursuit of profits over the well-being of communities that live around its facilities”, said Amit Srivastava of the India Resource Center which has led the campaign to challenge the new plant. The loss of the $25 million project is a major setback for Coca-Cola. The company has identified India as a major market where it seeks to derive significant future profits, particularly since Coca-Cola sales are being hit in more developed due to major health concerns. “We are delighted that the Indian government is doing what it is supposed to do – protect the common property resource of groundwater from rampant exploitation, particularly in water-stressed areas. “This should serve as a notice to other companies that they cannot run roughshod over Indian rules and regulations and deny community rights over groundwater”, said Srivastava.